With the growth of wisdom teeth severe pain in the gums, there is swelling that interferes with normal speaking and eating. This is due to the fact that the tooth itself is tearing of the surrounding tissue. To remove unpleasant sensations will help a number of procedures. Take pain medications. For example, "Take", "Analgin", "Ibuprofen", "Nurofen" or "nice" (non-steroidal anti-inflammatory). Observe the dosage indicated in the abstract to avoid poisoning. Like to drink tablets recommended no more than 5-7 days in a row then you must pass analysis of blood and urine, as may occur unwanted changes in the organs and tissues. Buy drug "Maraslavin" is a liquid consisting mainly of natural ingredients, which is used in dentistry. Moisten in it a small piece of cotton and apply to the tooth. Procedure is carried out 5-8 times a day. Gradually the swelling will start to subside and the pain to subside. Study the composition of fluids, possible allergic reactions. Dissolve 2 tablespoons of salt and 1 teaspoon of baking soda in a glass of warm boiled water. Rinse your mouth several times a day. In time the pain will pass. Instead of a salt solution suitable decoction of calendula and chamomile. Some people helps to relieve pain in the growth of teeth warming, others, on the contrary, a cold compress. Experiment with this. Apply a heating pad or a hot water bottle on cheek. If the discomfort only intensified, pour the ice in a plastic bag, wrap with a towel and apply to the affected area for 5-10 minutes. But be careful, the main thing - not to SuperCool. Contact your dentist if nothing works. You need to make the jawto rule out pathology of the growth of the wisdom tooth. 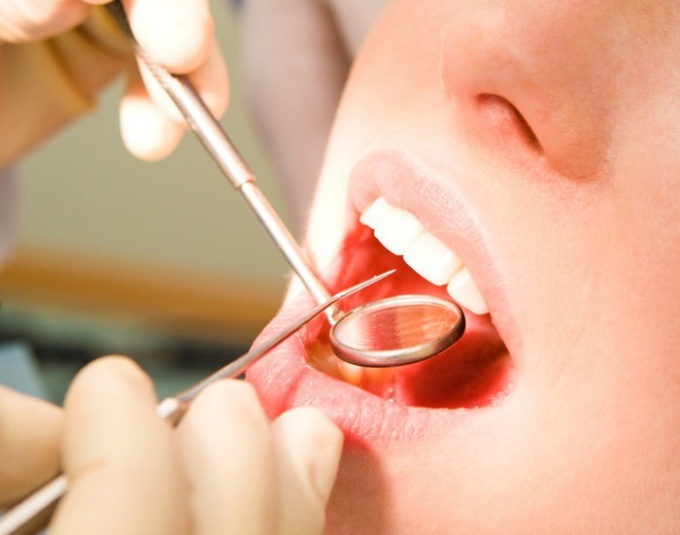 In some cases it is necessary to remove it, as it shifts the entire dentition that causes severe pain and swelling. Sometimes it is enough only to cut off part of the hood that covers the wisdom tooth. An experienced dentist will help you to solve this problem.